Your Droid X can send multimedia (called MMS) messages, which include a bit of audio or video or a picture. You use the same Messaging app on your Droid X that you do to send regular text messages. Not every mobile phone has the ability to receive MMS messages. Rather than get the media, the recipient is directed to a Web page where he or she can view the media on the Internet. Locate in the Gallery the image or video you want to share. You have to be viewing the image or video, so if it appears in a folder or an album, open the album and then touch the image to view it. Press the Menu soft button, and then choose Share from the menu that appears. Share appears on the bottom of the screen. Choose Text Messaging from the pop-up menu that opens. When the image or video is too large to send as a text message, you see a warning message. Dismiss the warning and try again with a smaller image or video. Type a contact name or phone number into the To text field. Type only the first part of a contact name, and then choose the proper contact from the list that appears. Type a message in the Enter Message Here text box. Touch the Send button to send the multimedia message. Unlike sending a text message, sending the multimedia message takes some time. After the message is sent, you see a copy of the image or video in the message history. Compose a text message like you normally do. Press the Menu soft button, and then choose Insert from the menu that appears. Take Picture: Take a picture right now and send it in a text message. Picture: Choose an image stored in the phone’s Gallery. Audio: Attach a song from the music library. Record Audio: Record an audio clip, such as your voice, and then send it. 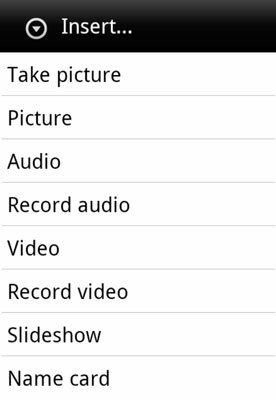 Video: Choose a video you’ve taken with the phone and stored in the Gallery. Record Video: Record a video and then send it as media in a text message. Slideshow: Create a collection of photos to send together. Name card: Attach contact information in the form of a vCard. More options may appear on the menu, depending on which apps you have installed on your Droid X. Choose a media attachment from the pop-up menu. Pictures and Video attachments: You choose from among media stored on your phone. Take Picture, Record Video, and Record Audio: You create the media and then send it. Slideshow: Presents a second screen, where you collect pictures from the Gallery. Use the icons on top of that screen to add pictures from the Gallery. Use the Preview button to examine the slideshow. Name Card: Displays the phone’s address book. Choose a contact, and that contact’s information is then translated into a vCard file and attached to your text message. A vCard is a contact-information file format, commonly used by email programs and contact management software. Whether the recipient can do anything with a vCard in a multimedia text message is up to the recipient’s phone software. (Optional) Compose a message to go with the media attachment. Touch the Send button to send your MMS message.